Oi oi! What’s good with the people dem’. Hopefully you guys remember the badman Sparxy that we did a review about back in May, with his ‘Mr. Robot’ EP (peep it here). Well today I want to take a look at another massive EP that was just released today on his Bacon Dubs label. 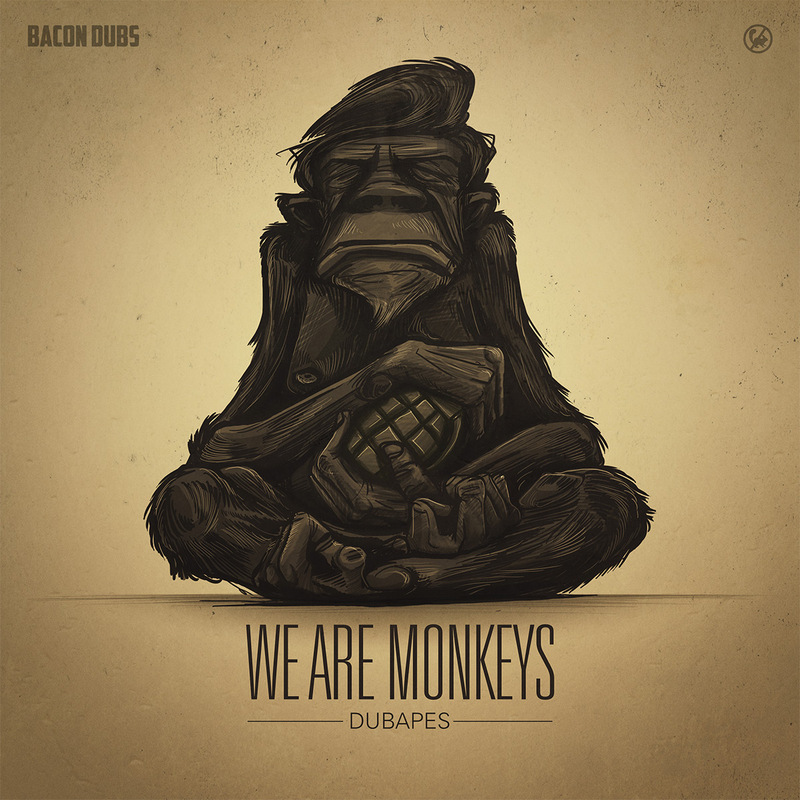 The EP is called ‘We Are Apes’ and hails from the Austrian duo, DubApes. I had absolutely no idea who these guys were prior to this release, but you can count on the fact that I have them locked in my sight from here on out. Marking the 7th release for Bacon Dubs, this 4-track piece of music comes hard with sub-flexing pressure and just the right amount of mid-range frequencies – something fresh and welcomed. The EP is introduced by the track ‘We Are Monkeys’. The track is eased in with ambient pads, eastern vibed winds, and harmonic droplets, all leading to a sound byte that clearly gave rise to the tracks name. Once the tune drops it’s a groove ridden journey through halfstep madness. The atmospherics in this tune really complement the vibe, giving depth and mysticism to this stomper. The second track of the EP, ‘Africa Calling’, is without a doubt my (and seemingly everyone elses) favorite tune off of the EP. This tribal bit can really transport ones mind into a primal state. The intro is drenched with ceremonial grunts and chants that build up to a pounding kick riddim’ back by convulsing sub-bass lines and intricately placed percussives. I honestly have to say that this is one of my favorite tunes released thus far in 2012 – absolutely massive. And just when you think it’s finished, the second drop throws a twist that will seduce each and every bit of your mind and body. Jeeeeeeeeeez. Following Africa Calling is ‘Hanuman Langures’. This one is probably my #2 for the EP. There’s just something about it that sets it apart from all other sounds. The pressure behind the kicks, the eastern mysticism, the carefully placed amen breaks, it just takes form so beautifully. The DubApes incorporate a multitude of influences flawlessly, forging ahead with a very distinct sound repertoire. The EP’s final track is ‘Pandora’s Sorrows’. A beautiful way to finish the release off. This track is the epitome of uniting the frequency spectrum in a proper fashion. Hard-hitting sub pressure sits tightly behind modulated growls and emotive wind instruments. The subs FLEX hard on this track. Check the clips below! I find it pretty much fail-safe to say that the DubApes will be on a quick rise in the ranks throughout the remainder of the year, and into the future. Their styles are a refreshing reminder that the possibilities within the 140 arena are truly endless – the best thing about dubstep. This entry was posted in Artist Highlight, Dubstep and tagged Austria, Bacon Dubs, Bassweight Society, Dark, Deep, DubApes, dubstep, Minimal, Sparxy, We Are Monkeys. Bookmark the permalink.